NB! This prognosis is valid and reliable only if the birth data of both candidates are correct. 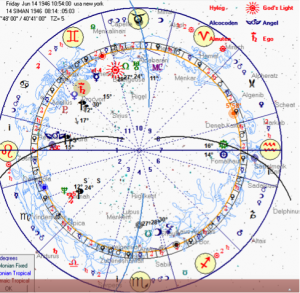 This report is made using the sidereal Babylonian zodiac, as used 5000 years BC in ancient Mesopotamia, depicting the real situation on the sky, and not the tropical zodiac that is used by almost all contemporary astrologers and does not show the astrological reality. The rising sign of Trump is Leo, and the term of the ascendant is Saturn and this describes the native as very inventive, gifted with many abilities, adaptable and creative. This particular term stands for someone with very depressive and unreliable character. The king fixed star Aldebaran only four degrees from the meridian is the reason for the tremendous wealth and fortune of the native. The Sun in the 10 house of career and in the horns of Taurus is the reason for his high rank and powerful position in society. The Sun in Martian term is an indication of his means of growth and high ambitions. The trine aspect of the Sun and the stationary Jupiter in the house of money is only and additional factor for his wealth and powers in the society. The full Moon in the horoscope denotes additional power to the native but has also has a destructive impact on his character in terms of instability and unreliability. Mars out of sect in this horoscope in a term of Jupiter in conjunction with Regulus, in the rising sign is assuring his strong dominance and aggressive attitude, but also makes him a natural leader and courageous person. This can also be a sign of tremendous success in career and rank. Mars in addition could create risky and dangerous life environment for the native including problems in the marital life. Trump is very intelligent and smart according to Mercury in a phase in the 11th house, but the Mercury Saturn conjunction is describing people that are hypocrite, manipulative and not always tell the truth. This also gives him very powerful connections and friends. Saturn is in the 30° of Taurus making a strong link and conjoining with Venus in Cancer in the 12th house. The nature of the 12th house that is about all secrets, secret services and institutions, is an indication about the native’s involvement is such affairs. The same is seen from the Moon in Saturnine term in the 4th house of the nation and the homeland. On 31st of July Venus entered Leo to join Jupiter and Mercury there. This is a moment when Trump will gain momentum and will seam successful up until 11th of August when Jupiter will leave his ascendant and will descend from supporting him as done since July 2016. 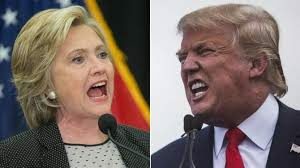 On 12 of August the Moon will activate the dangerous conjunction of Mars and Saturn, which are opposing Aldebaran in Trump’s natal chart and this can create some tensions and problems in his presidential campaign. Saturn will not leave his position until 31st of January 2017 and can have a destructive impact on the elections that will take place on 8th of November this year. The trine aspect of Jupiter to the conjunction of Saturn and Mars might help, but I am not sure to what extend will overpower the square of the same planets to the descendent. On November 8th, the transiting and progressed Jupiter will be aligned with the natal Jupiter in Trump’s chart to make a harmonious aspect to the 4th house of the homeland and nation. Thus, the power of Jupiter will be tripled and this might be very helpful for the election result. Gemini falls under the 9th house in Trump’s Solar chart with the Sun and invisible Venus. Jupiter is in the 11th house in the solar chart. In the natal chart Mercury in a phase and Saturn are in Gemini. 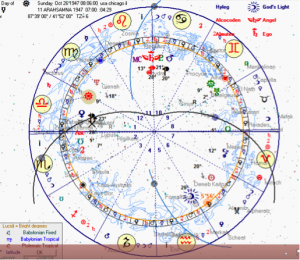 Mercury in phase on the solar chart is to say that about three months from the native’s birthday an important mercurial event will take place; most probably a significant change in the course of action caused by Trump self. Mercury is in conjunction with Aldebaran to give additional powers to this solar chart and to Mercury who is ruling the year via Gemini being a profected ascendant for 2016. The rising sign of Hillary Clinton is Libra with Martian ascendant term. This describes natural leaders, constant, steadfast and who firmly defend their position. 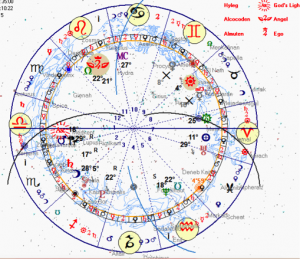 The conjunction of Merury, Venus and the Sun in the rising sign is also very powerful and the link of the Sun with the 7th and 11th house of the people and the nation are ensuring her rank and political powers and very beneficial marriage that is denoting her additional rank and career opportunities. The fixed star Rigel on the western horizon gives her fortune and good luck. The conjunction of Saturn, which is not well positioned in Cancer and Mars who is out of sect are describing a career oriented and very despotic person. The two planets square Venus, the Sun and Mercury to create imperious and harsh people that are slanderers and lyers. The planets make trine aspect to Jupiter in the house of money to give her additional powers and wealth, but also dangers. This particular square aspect can destroy the good luck in the native’s life. On 31st of July Venus entered Leo to join Mercury and Jupiter. This is happening in the 11th house of the native and is making a harmonious aspect to the ascendant and influencing well the public appearance of Clinton. In November 8th Jupiter will move to the 12th house in Clinton’s chart and will not be able to denote his blessing and good luck. Venus will be far from the ascendant to help, but Saturn being in Scorpio in the 2nd house will not harm the elections in particular. The progressed Jupiter will align with her natal Jupiter, which is in the 2nd house, and will denote some limited help via harmonious aspect to her 4th house. The profected ascendant for 2016 is Cancer, 10th house in Clinton’s chart. The native Cancer falls in the 9th house of Clinton’s solar chart. Mars and Saturn in the natal chart are to be found in the 3rd Capricorn house and the 1st Scorpio houses. These do not necessarily denote a success on the presidential elections. Moreover, Saturn on the ascendant of the Solar chart only 6° from Antares is not a good sign. However, Aldebaran is on the western horizon to give power and luck to this horoscope. This prediction is only valid if the birth data of both presidential candidates is reliable. The natal chart of Trump is very powerful containing Aldebaran on the MC. The progressed and transition charts on the day of election are more favorable for Trump than for Clinton. 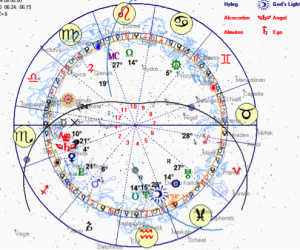 The Solar return charts of both are almost equally favorable for the presidential campaign. Both, Clinton and Trump have almost equal chances to win the president’s vote, but I think that the chances of Trump are higher mainly due to his extremely powerful radical horoscope. Mooi om te lezen hoe hun horoscoop in elkaar zit, met oog op de verkiezingen. Het is een spannende race en je moet een lange adem hebben wil je dit doorstaan. In de media worden ze finaal afgemaakt en de gek aan gestoken. Beide zijn ze ook volhardend en hebben een sterke focus. Spannend hoe de eindrace zal verlopen in november 2016! There’s certainly a great deal to learn about this subject. I really like all the points you made. Thank you very much, indeed! I am glad it is useful. If prediction is wrong, birth data is wrong.